As I’ve previously posted about, there was a great C++ track at NDC this year. It turns out that videos of all the talks are now out. Big thanks to Olve Maudal for putting together this track! And thanks to all the speakers for interesting talks and some nice chats. You can see my talk “So you think you can int” here, and find my slides here. As someone who doesn’t do web development, and didn’t use to do any .net, I’ve not always been too excited by the Norwegian Developers Conference agenda. This year however, I’m very impressed by the C++ track organized by Olve Maudal et. al. 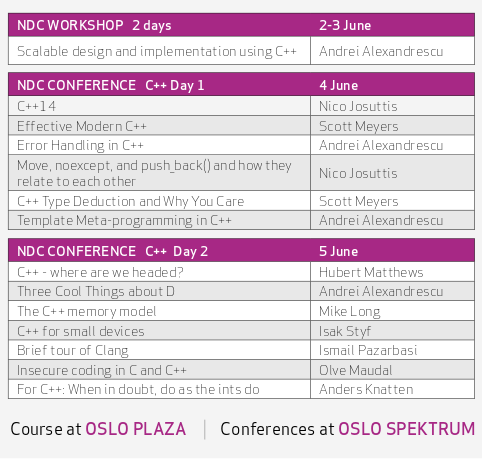 See the full agenda at ndcoslo.com, especially Wednesday and Thursday. I’ll be talking about ints. If you think that sounds like a narrow topic, rest assured there’ll be a char too! Oh, and a secret tip, if you’re a member of Oslo C++ Users Group, contact me for a discount!